Earlier in June, I had tasted the sting of my first Did Not Finish. At mile 64 of the San Diego 100 I called it quits. My DNF was due to many factors it is true: failure to fuel adequately leading to fatigue, miscalculations on pace leading to stumbling in the dark with only prescription sunglasses to see by, a missed flag leading to a mile off course. 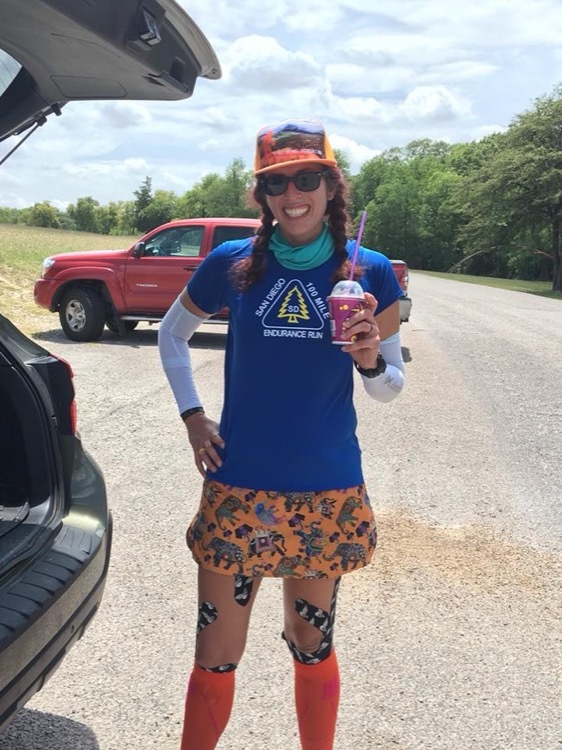 But in all honesty, when I came into that aid station at mile 64 with five minutes left to cut off, when I needed to rally and turn back up the mountain and forge ahead, when I needed to find my fire, my fire had burned out. Mentally I was gone, and I had been for some time. And so I turned in my bib, I stopped, I took the out. After San Diego I felt incredibly unfinished. Physically, I was in better shape than I had ever been, as is proven by how good I felt after the race. But mentally I had broken. I needed to prove to myself that I could finish one hundred miles, and I wanted to prove to myself that my mind was stronger than I let it be in San Diego. I knew I still had a race in me, I was feeling marvelously good for having run 65ish miles. I figured if I took a week off to recover, a week of easy running, a week to train, and a week to taper, that I could try again in a month without a big training cycle. I had promised my family I would be more available this summer after San Diego, and I didn’t want to dive right into another training cycle to prep for a fall race. I wanted and needed a break, as did my family, so I wanted to capitalize on my current hundo fitness. But I had exhausted our race budget travelling to San Diego with my crew. I couldn’t afford to travel to another race, even solo. Finding hundred mile redemption seemed impossible. And then while running one day, I concocted a stupid crazy idea of running a hundo… alone… at Erwin Park. Each summer my son goes to stay at grandma’s for a week with his cousin. This year, grandma camp was set to be the week of July 9th, exactly one month after San Diego. Since I work from home, my schedule is flexible. I figured I could run July 10-11 and take the minimal amount of time from my family, as my son would be at grandmas and my husband would be at work during the day. Erwin Park was a logical choice. It was close and easily accessible, being less than 20 minutes from my home. I could park in such a way to split the almost 10 mile trail nearly in half, giving me frequent access to supplies. During the week it wouldn’t be too overrun with bikers. And since there are camp grounds near the pavilion, I could reserve a camp site so I wouldn’t be breaking any laws by being there overnight. Plus, the city would leave the gates to the park open if someone reserved a campsite, which would allow any pacers I could find to come and go throughout the night. Because that was my husband’s one big requirement for this to work. If I did this, Chris wanted people to run with me all night. He understood my need to do it, he thought I was crazy (he thought it, I knew it), but he supported me. But he also wanted me to be safe. 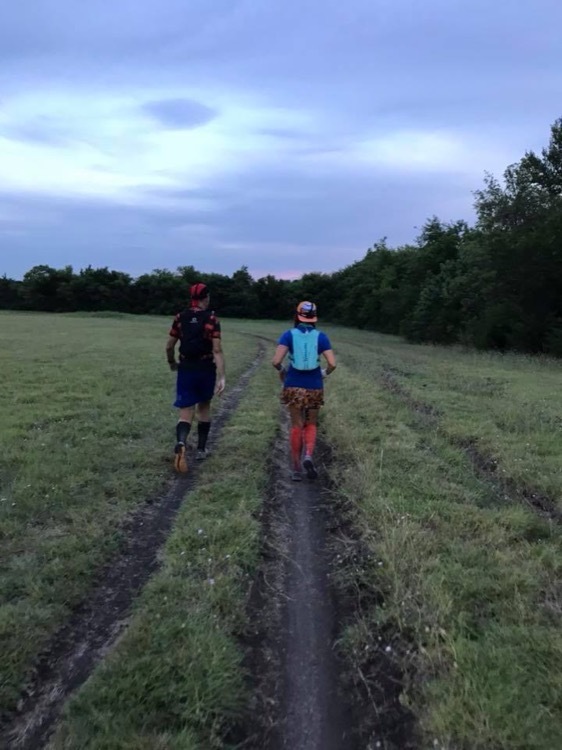 Running alone for all day and night, without aid station volunteers, check ins, and cut off times to keep track of you on the course could be very dangerous. To be safe, I promised to check in with him after every loop during the day, and to have someone running with me all through the dark. If I couldn’t have someone with me all night, I promised I would give up my crazy idea. I honestly didn’t know if I could find enough people that would be available to run through the night on a weeknight. I figured that would be the end of my scheme. People had to work after all, not everyone had the flexibility that I did, or the intense need to make this succeed in spite of work schedules. But I consulted my coach, Greg, and I sent out a call to all of his athletes (we call ourselves Team Ninja) to see who might be able to run. I was so floored by the response. I had so many people wanting to help! So I created a group event on social media and invited everyone who had volunteered and a few other runners from my own friend circles. Before I knew it, I had more people wanting to run than I had shifts available. I would be having multiple runners with me most of the night… I have never felt so grateful for and so in awe of the running community! The organization of this run really is the long story, the running seems relatively short. On that warm Tuesday morning, I packed up my car with 3 coolers (1 for food, 1 for fluids, and 1 just for ice) and every pair of trail shoes I own (plus Birkenstocks just in case!). I headed to the trail and started running. My coach had ridden the course on his bike with his wheel odometer so that we had exact mileage for a full loop and for a shorter half loop. We didn’t want me to overshoot my mileage by 10% trying to appease my watch, which frequently lost a half mile per loop with switchbacks and tree cover. Each loop I came in and recorded the loop and the time, serviced my needs from my car/mobile aid station, texted the group keeping track of me, and headed back out alone. For 39 miles, I only saw a few bikers and one highly irritated red hawk on the trail. A Slurpee delivery from a friend in the afternoon was the first friendly face I saw all day. By mid-afternoon, the clouds were growing thick and dark and starting to sprinkle. My Achilles do not hold up well to mud, and I didn’t want to risk any more damage than necessary for my unofficial hundred. Chased by the thunder I heard to the south, I pushed the pace coming in from the last trail loop so that I could switch to the pre-measured section of gravel road we had set aside as a contingency for weather. I was so focused on getting back to the car that I nearly ran head first into Greg, who had biked out to check on me. At my car, we treated a few blisters, and headed back out. After a gravel loop, the weather seemed to clear without any real rain. The trails were still dry. So I picked up my first “official” pacer, Bryan, and we ran one more full trail loop, finishing just as dark settled in enough for head lamps. The rest of the night I ran shortened, five mile loops, giving me bite sized portions of the trail to mentally conquer. I was paced by so many friends: Jill, Pam, Jen, Cathy, Fiona, Lisalynne, Kelly, Kara. I often had two and sometimes three pacers on a loop. And it was a full on party back at the camp site! They had tents and pizza and drinks. When I would come in everyone would flock over to help, tending to my every need from rolling calves to filling bottles and stuffing my hands with food. I’m not going to say it was easy. Running a hundred miles never is. And by this point I was shuffling, and then hiking, more than running. By dawn most people had left. Although many had taken half days, or opted to work from home, so that they could come support my stupidity, most understandably had commitments that pulled them away as the sun rose. Cathy got me in to the camp site at a little over mile 79, and I had finally succumbed to tears. The entire loop I had thought I only had 16 miles left and I just couldn’t wrap my head around 21. It was my lowest point, my only time to doubt that I would finish. But my friends took care of me. My husband had brought breakfast to the trail. He basically told me to not come home until I was done, no matter how long that took. It may sound harsh, but it was just what I needed to hear. I sobered up and headed back out with Kara for two more laps while everyone else had to leave. It was in my last loop with Kara that I felt the blister encompassing my left pinky toe burst. Not really pain at first, but a stinging followed by oddness. We hobbled in near mile 90 and tried to doctor it the best we could, but it was a complete mess of tissue beyond repair. On the next loop with Fi I rallied a little, actually running some for the first time in hours! But then almost instantly my left foot seemed to swell beyond the shoe. I could barely walk and even resorted to going sock-footed as we came in to the car. Greg and Chris were back as we came in. I couldn’t wear shoes on my left foot anymore. So Greg taped my Birkenstocks onto my sock feet and my husband and I headed out for the last loop. He had never run more than a 5k, but he wanted to do this with me. I was amazed. It was slow going that last loop in sandals, but peaceful. I knew I would finish, it was just a matter of when. We walked and talked, Chris caught me up on his day. He told me how proud he was of me. He encouraged me. He was everything I needed and more. It was so special to share that time with him. We finally made it around the loop and Chris started texting Greg and Fiona that we were getting close. As I came into the parking lot near the car, Greg and Fiona held out a paper towel ribbon for me to break. And then it was done…I finished. It took 33 hours, but I finished. There was no fanfare, no big finish line. Just the four of us and a chair. One of my night time friends had left champagne for mimosas, so we shot a cork across the campground and then had to go find it. We toasted. Greg surprised me with a custom-made buckle. I was completely floored. I cried more than I did at my first hundo. I didn’t do this for a buckle. I did it for something much deeper and simpler. But that buckle meant so much. 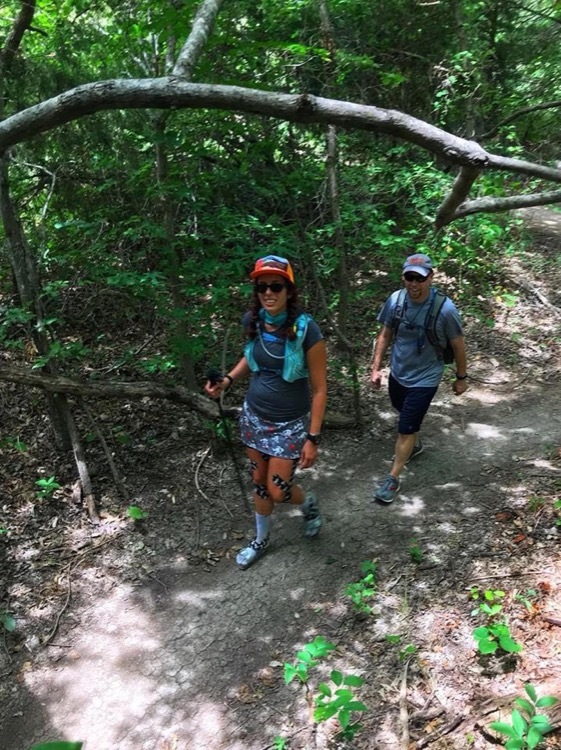 Michelle Ekrut is a wife and mother, running and writing her way through life in Texas. 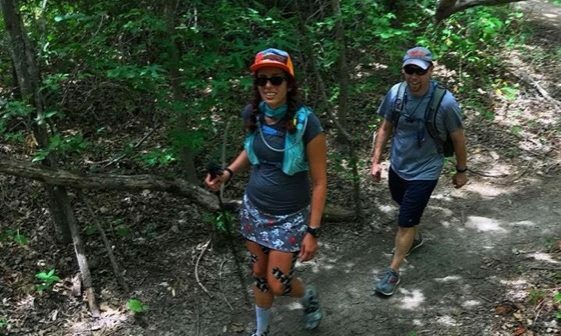 She has run more ultras than marathons and last fall buckled up at her first 100-miler. She has been writing most of her life, but most of it stayed in her head until recently. She writes about life and running at runwriterepeat.com. Awesome story, way to go!! As a North Texan (Trophy Club) who has done a few 100’s, I applaud your doing this without the hoopla of an organized race. I often chuckle at the complaints of folks who don’t get into one of those races… as if there are only 100 miles in such an event. You have proven yourself worthy and have proven them wrong! Congratz! !